I came home today to this!!! How lucky am I? This, my friend, is about 15-18 yards of wood chips. I need 32 to 48 altogether for the large Back to Eden garden I'm building. Scott of Scotty Tree Service dropped this off for me today. So now, thanks to Scott, we can move forward even quicker than I had anticipated. There is another 12 yards coming Saturday. I will be posting a series of Back to Eden Garden posts. I am going to detail every step. The creation of the garden, the planting, the aging of the mulch, the growing, the fruit tree planting and pruning...everything. Because the garden project is on hold until fall, these wood chips can now go into my own back yard to eliminate all grass, making every inch available for garden if I want it. And at the very least it will break down into beautiful black loam that will be full of microbes and worms. Perfect. Wow Erin that is a lot of wood chips! That'll keep you and Al busy! What is a Back to Eden garden? A Back to Eden garden is a technique refined by Paul Gautshi in Washington State. 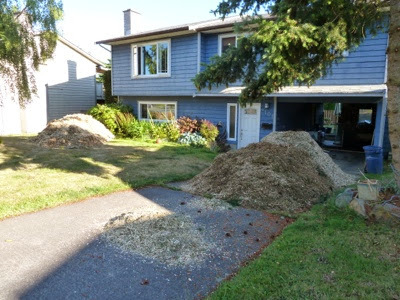 It is the layering of compost, manure and wood chips. Once mature it requires no water and there are few weeds. They can by pulled easily and he was in clay too. There is a lot of talk of god in the video, but I just think of it as nature and the universe. So rather than asking god for the answers I just look at the tree, say, and wait for the answer. It has been remarkable. The mulch does hold water. It is working for the heat wave we are in.